Telegram APK can be used for android owners and now the latest version is 4.7.0. 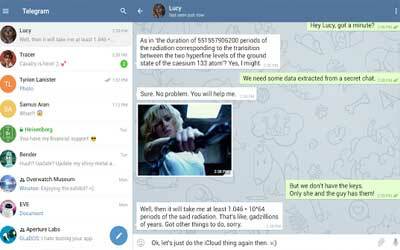 Well, nowadays you can try telegram software that can be used for messaging people. It is the service that provides you instant messaging. Besides that, it also focuses on multiplatform and privacy availability. Not only can be used by android users, it can be also enjoyed by iOs, Windows phone, and other gadgets with desktop system. Then, users can also exchange the encrypted messages end to end and messages with self destructing. You will be allowed to share photos and videos maximally about 1.5 GB. Swipe left on any message to reply to it. Granular settings for auto-downloading media. Full link previews for Instagram posts and tweets with multiple attached media. Support for albums in Secret Chats. Full support for MTProto 2.0.